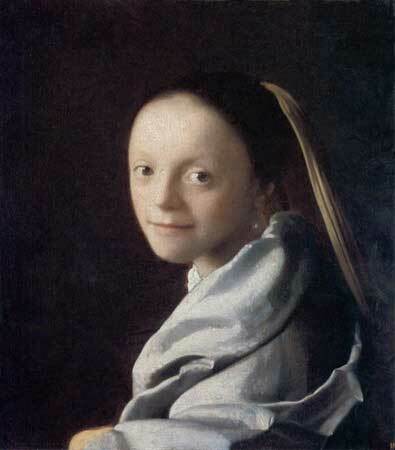 the website about the seventeenth-century Dutch painter. You might also be interested in hearing the names on my Rembrandt and Early Flemish and Dutch Painters pages. 'Mechelen' is the Dutch name of a Belgian town famous for its lace, 'Malines' in French, 'Mechlin' in English. 'Donderslag' (Thunderclap) refers to the 1654 explosion of the Delft municipal gunpowder depot that killed many, fellow painter Carel Fabritius among them. Vermeer, die meesterlyck betrad zyn pade. 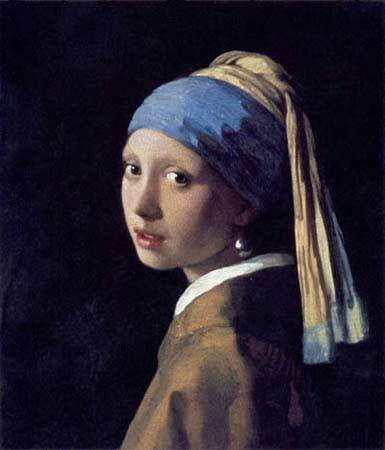 Vermeer, who masterly trod in his path. There is a well-known song about admiral (and pirate) Piet Hein (also spelled Heyn) and his 1628 capture of the Spanish silver fleet; the song may well be recent, but it could also be something that Vermeer and the people in his paintings were familiar with. The root of the painting words is "schild," meaning "shield" and derives from the Germanic custom to paint warriors' shields. 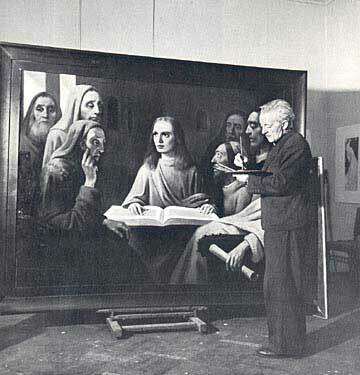 Van Meegeren at work on "Christ amongst The Doctors"
In the 1930s, an hitherto unknown Vermeer painting was offered to Vermeer authority Abraham Bredius who came to believe it was the real thing; a few more turned up in the following years. In 1945, one was found among Hermann Göring's possessions, sold to him by Han van Meegeren, who was then accused of collaboration with the nazis; but Van Meegeren explained the painting was a forgery that he had traded with Göring for 200 Dutch paintings looted in 1940, and to prove it he produced another 'Vermeer' while under house arrest. More from Jonathan Janson's The Essential Vermeer. 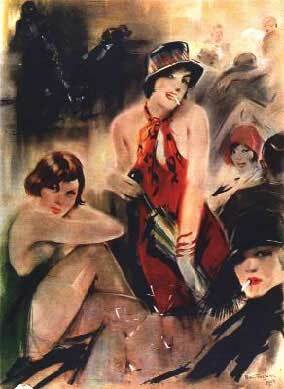 This material may not be published, broadcast, rewritten, redistributed, or hotlinked to.